We are using messengers on our phone devices very often for our relationships, business etc. We can share some special informations while we are talking with people on these messengers and maybe we can share some secrets about our business. WhatsApp is probably the best and the most used messenger of the world at the moment. Sometimes people would like to delete backup files from the application because of reasons we have mentioned above. 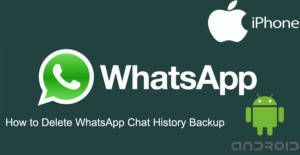 Saving messages and backup them gives that trouble to us but we are going to give you some tips for removing these backups from your device permanently. 1-) Run File Manager application and tap on Internal Storage. 2-) Swipe Down until you see the WhatsApp folder on your storage and tap on then tap on the folder. 4-) Delete all files on this section. 1-) Run File Manager application on your iPhone or iPad. 2-) Tap on Local Files and then tap on WhatsApp folder. 3-) Tap on Databases folder. 4-) Clear all files on Databases Folder. If you have any question about this issue, please don’t hesitate to comment on this page. We are going to respond you as soon as possible.